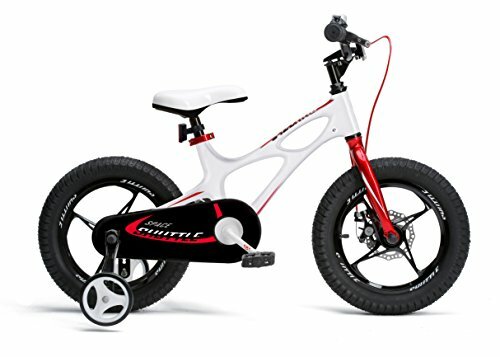 Best bike for a 5-year-old boy? 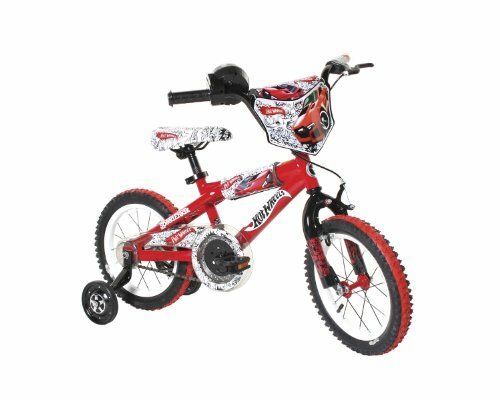 Best bike for an 8-year-old boy? Best bike for a 10-year-old boy? Which bikes for 9-year-old girls? What Bike for a 12-year-old girl? Navigating your way around the kid’s bike industry is sometimes a lot harder than you initially think. It doesn’t matter whether you’re investing in a bike for a 10-year-old boy or something a little smaller, there is something out there for all budgets and styles. Naturally, when choosing a kids road bike, personal preference is a huge factor in deciding what would best suit the child. Yet, there are also a lot of quality factors to think about too. The size of the wheels, seat comfort, and handlebar length are just a few essential factors you should consider before buying a bike for your child or anyone else’s child! Does your child want a 2-wheeled bike or a kids’ tricycle? The best bikes for kids aren’t always the best kids bike brands either, people tend to think the best bikes are those that cost the most, but there are actually plenty of budget bikes for amazing price tags that are ideal quality. We’ve put together a list of the top 10 best bikes for kids, it’s always worth bearing in mind that kids bikes tend to be on the pricier side. But, you should also think about the fact that they grow rapidly and spending a lot on kids mountain bikes that might only last a few months isn’t a good idea. We understand it’s tempting to get a fancy kids road bike with lots of extras, but the truth is, children often don’t care about things that are expensive – they just want a road bike to ride. Looking for power? The Razor MX500 electric motocross kids bike could be the answer! To help you a little further we’ve also included a buyer’s guide that will identify what to look out for when you’re on the hunt for a new bike for your child. Knowing how to find a perfect road bike that fits all your child’s needs could be the making of your purchase. You really could save yourself a lot of effort and money in the long term. 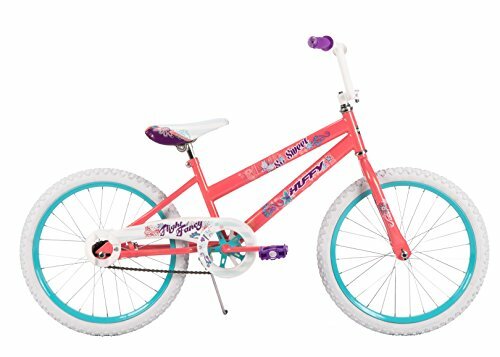 For anyone who’s in need of a kids bike that comes in different colors and sizes, this RoyalBaby BMX Freestyle bike is the perfect choice for your child. The BMX bike also includes multiple extra components that can be used to help them in learning how to ride their bike properly. The frame is sturdy and has enough stability and support to allow the child to have the ultimate balance. The BMX bike is just a super easy to ride, fun, and a comfortable road bike that your child will love. And, when it comes to the older children, they will want to do as many tricks as they can! The rubber tires are heavy duty and made of pneumatic rubber with steel inside the wheel. This is particularly good if you want a bike that is long lasting even though it’s not too expensive. When thinking about the rear hand brakes on this RoyalBaby model, it appears that they’re very responsive and your child will be safe when they want to stop, no matter what speed they’re traveling at. Plus, the seat is contoured to a more comfortable shape, they may never want another bike again! One of the best things about this BMX bike isn’t that it’s super affordable, but it’s that you can adjust the size of the bike seat and handlebars easily meaning the bike will last a long time. Why We Liked It – This BMX bike has all the components you could need and looks great too. To even add to the greatest of this model, it’s affordable but looks very expensive. Everyone will be super jealous of your child if they roll up to school with this model, it’s such a great choice. Perhaps you’re looking for something a little more colorful? This Dynacraft Magna model is another amazing pick for any parent who wants their child to love bike riding. It’s one of the best bikes for boys and girls, so there’s nothing to worry about when it comes to gender. The build of the bike allows for a smooth and safe ride even at such a reasonable price. Adding to this, the seat is adjustable, so when your child grows in inches, the size of the bike will grow too. There’s simply nothing worse than finding the perfect sized bike and then your child has grown out of it in a matter of months. The bright yellow and black colors of the bike are easy to spot if you’re in a crowded area and wouldn’t be a problem finding it in the dark night time. It’s recommended for children from 4 to 8 years old. This is a long time to have a bike, but according to customer reviews and sources, it does last that long! Since everything is adjustable too, you never have to worry that they will grow out of it. The added training wheels are even better if they’re learning to ride as it gives extra balance and support for a nervous child to ride. One flaw it unfortunately faces is that the tires are a lower quality than other models, this doesn’t directly affect the bike too much, but it does mean that it might not last as long. Why We Liked It – Although it doesn’t come in different colors, this kids bicycle is still a really nice quality. You can see that despite being lower priced than other models, the build quality is high. We love pedal bikes that are amazing quality! Made with a girly girl in mind, the RoyalBaby Stargirl girl bike is super pretty and has lots of extras you don’t even expect. The steel frame makes for an easy and smooth ride, it is also strong and can withstand heavier riders. The frame is finished in a chrome blue paint with white tires and pink accents. What makes everything better is that this model has a blue wick basket on the front for all your little girl’s needs! She could choose to put her favorite dolly, teddy, or anything important that she needs on her travels. The pink adjustable seat is slightly different to other models because it is more contouring and has a small back so it’s even more comfortable and can be ridden for a long time. The handlebars also have extra padding for comfort, and they’re pink, so if you have a little girl who loves anything pink and sparkly, this will be her favorite toy ever. This girly girl bike has extra safety features and comes with training wheels so if they’re anxious about riding a children’s bike for the first time – you know they’ll be fine. However, it is heavy, and this could affect whether it comes out with you. It is also quite expensive considering it’s only suitable for younger girls. Why We Liked It – Bike designs can be boring, but if you’re looking for a suitable bike that has lovely colors and looks pretty, this is an excellent choice. Most little girls would love to ride around on this cute starter bike. 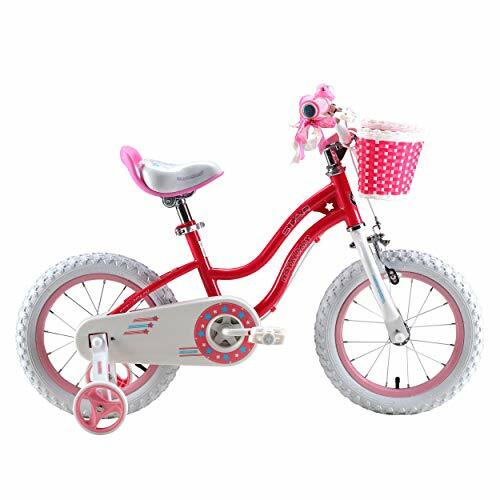 Boasting a matte hot pink steel frame, this Huffy So Sweet model is ideal for children between 3 and 6 years old. The steel frame even comes with incorporated diamonds which are fit for a beautiful princess. 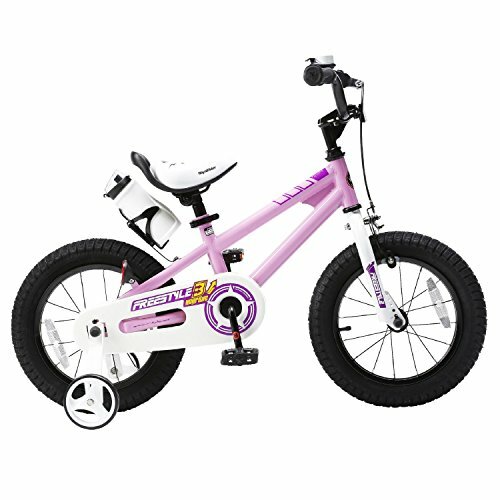 As well as the hot pink frame, it has purple and white accents which are cute and make any little girl want to ride it! The added wider training wheels add stability and give the younger riders more confidence in their ability to ride their bike. Yet, while this children’s bike with training wheels is great for children and younger girls, it does have some flaws. One of these is that it doesn’t have many extras such as a wicking basket or safe and supportive tires. It’s also quite expensive for a young child’s bike when compared to other models available. Despite this, it has a wonderful build for little budding racers, and many customers have reviewed it saying it lasts a long time, and their child loves it. 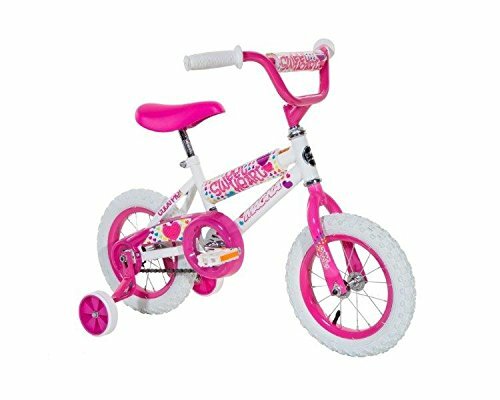 Why We Liked It – It’s not every day you come across a super girly bike like this one, if you have a child who loves purple or pink colors and wants a new kids bicycle – this is the best choice for them. What more could you want? It is perfect! Bikes with training wheels are always a great option for new budding racers. For those of you who are on a budget, this RoyalBaby CubeTube model is the ideal choice. It’s relatively inexpensive but still looks high quality. It comes in multiple different sizes and colors so it can be ideal for boys who want a green or blue design, or pin and white for girls who like a lighter and more pretty style. It has an enclosed chain guard, so they’re safe from any accidents and non-slip pedal grips, so you know they’re always safe. Another great addition to this model is the bell and adjustable seat and handlebars. This model can grow as they do, which is always a money-saver and big bonus! It’s supportive, fashionable, and has the extra components you need to ensure your child is always safe on their ride. The tires are sturdy and long-lasting, so you know you’ll probably not have to buy another bike for years to come. One flaw it has though is that if the chain derails then you have to take the whole thing apart due to it being covered with a plastic cover. Although this is only a small flaw, it’s something to consider. Why We Liked It – It has hardly any issues and so many customers love it, it’s ideally priced and is a great Birthday or Christmas gift if you’re not sure of what to get your child to ride. They will learn how to ride a bike in no time with this supportive and safe model. 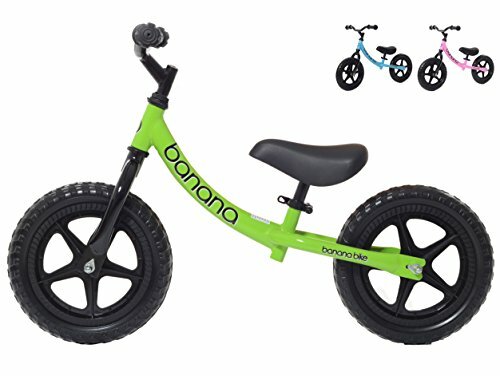 Perfect for smaller riders who like to push themselves along without pedals, this kids balance bike by Banana is the ideal choice for any parent who wants to get their child used to use a starter bike without the hassle of buying a real one. This kids balance bike suited for toddlers aged between 2 and 4 years old, and it’s lightweight, so it’s no problem if you have to carry it around the park when they want to run around. The tires are puncture proof too so if any nails or earrings get in the way, they’re not going to pop the tires. This kids balance bike is relatively inexpensive when it comes to children’s pedal bikes, but this is mainly down to the fact that it’s a balance bike and the child will grow out of it in a matter of years. Unfortunately, it doesn’t have an adjustable seat, but it does come in all different colors, even yellow and red! The handlebars are also stable but static, so you can’t adjust them, this is another reason why you should only get this kids bicycle if your child is smaller. The steel frame is supportive and steady which is ideal as it’ll most likely be your child’s first ever bike. Why We Liked It – Sometimes children don’t feel confident enough to ride a bike with pedals, and kids balance bikes give them the perfect opportunity to get used to the feel and look of a starter bike before they ride a bigger one. They can build confidence and feel less anxious as they move on and start riding a bigger bike. Add a little style and elegance to your little one’s life by purchasing this model. It has a light magnesium frame that allows your child to be comfortable and perform well, even when it’s raining! Although it’s light, it is still strong and is able to ride faster than other models at a fraction of the weight! The tires make it easy to navigate all different road types and grounds such as grass and even snow, if they want to ride, they can. It’s durable and has a single-speed bike system, so it’s easy to ride and doesn’t make the child feel unsafe. It’s also super resilient for riding off-road and on uneven ground. Considering the price, it’s an affordable alternative to other models, and it’s a great deal. Yet, there are some minor flaws that we have to address. It’s not so easy to assemble and takes a while if you’re not used to setting pedal bikes up. It also lacks extra features that other models have. Why We Liked It – Having a durable frame is essential for a child’s bike because they will use it a lot and it needs to last a long time, if you’re spending a lot of money on a starter bike then you want to make sure it’s worth all your pennies. 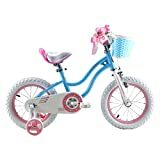 Anyone who’s looking to save a lot of money but still wants their child to have a top-quality children’s bike, this is a choice you may want to opt for. 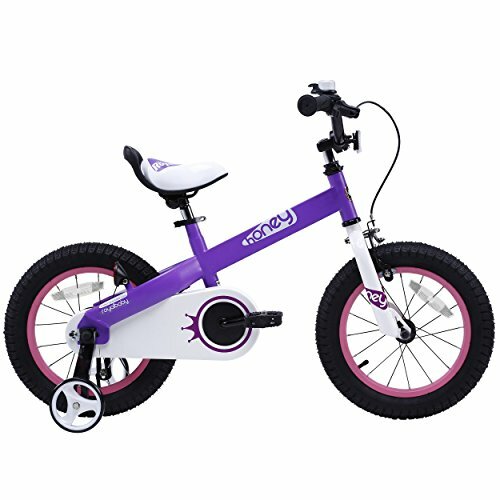 The Magna Girls bike is ideal for younger children since it’s only 12 inches. It is suggested girls aged 4 to 5 use this model as they’re typically a lot taller as they grow older. It has coaster brakes for a safe stop at any speed, even if they’re going super fast. It also has training wheels for any little one who is slightly unsure and anxious about riding a bike for their first time. The pedals have grips and reflectors for safety, and the seat is contoured, so it’s comfortable to ride for an extended period of time. You don’t need to worry about them being uncomfortable on a long journey. It is bright pink and white with some cute characters along the side for added fun too. It’s an excellent choice for the younger ones. One major flaw is the tire material, it’s not durable, and they may pop easily which is a risk for a children’s bike. It’s quite rare to find a child’s bike where the tires are high quality. Why We Liked It – It’s a safe and supportive option, an excellent choice for parents who aren’t sure what type of bike their little girl needs. Let’s talk about bikes for girls on the higher-end of the market. This RoyalBaby model is super cute and pretty. It has a contouring seat with a slight back for extra support, it also has cute white heels they are perfect for a little girl who loves to feel like a princess. It even has a plastic basket at the front of the kids’ bicycle to carry all their essentials, lipsticks and dollies a like. If they need extra support, there are training wheel included for the younger children who need it. There is also some added features including sparkly ribbons that can really make riding the kids’ bicycle even more fun. However, there are issues with the build quality of this model. Considering the price of this model, you would expect it to be built better and with more high-quality materials. Why We Liked It – It’s definitely a bike that your little girl will love to ride. It has so many extra features they’ll love, and they’ll never get bored of riding it. Now moving on to bikes for boys, this Dynacraft Hot Wheels model comes in a super awesome design; red, black and orange colored. It has a plastic cover on the chain was great for safety, it also has other added safety and security features. This is ideal when you’re buying a bike for kids to ride. It also has a comfortable seat that is adjustable as well as adjustable handlebars. Yet, it still has some flaws we must consider too. It’s only ideal for children who like darker colors, it’s not the best build quality, and it lacks any added extras such as training wheels or a wicking basket. Why We Liked It – Most of the time, boys’ bikes are boring and don’t have a lot of colors. This one is a great alternative for your younger child who wants to have a colorful bike with a cool design incorporated on to it! A wonderful bike for kids to ride. What to Look for When Buying Kids Bikes For Boys & Girls? The central aspect of buying a bike for your child is choosing one that fits them correctly, you shouldn’t look at pedal bikes that your child will eventually grow into because they won’t be able to make use of it now. It’s always better to get something that fits but has room to grow too. You want them to have it for as long as possible, not just a simple few months. Both boys and girls have different needs and depending on the child’s age, they may need something different. You wouldn’t buy the same road bike for a 4-year-old as you would for a 13-year-old, the sizing and weight just wouldn’t fit them properly. Below is a list of what to look out for when you’re shopping around for kids bikes for boys and girls. It’s essential you keep these in mind when you’re looking through all your options, and you know exactly what would suit your child perfectly. These are important if you want the bike to last a long time. Your child will grow and inevitably put weight on which means they may not suit all bike sizes. There are certain models and styles available that are better suited to a certain child and their weight. If you have a child who is too heavy or light for the mountain bike, then they won’t feel comfortable riding it, and it could end in a disaster. It’s always better to check the weight restrictions on anything they will ride on before you purchase it. Enables the child to turn the handlebar easily and freely, unlike the plain bearing. There are various types of steering you can get, but if your child is unsure or it’s their first kids’ road bike, then we would suggest ball bearing since it’s easier to control and they will feel confident riding and steering it. They know they will have complete control of their mountain bike which is great if they’re nervous or anxious about riding anyway. While they’re not essential, these tires are the lightest and most comfortable to ride a bike on. They’re great for riding over bumps, and your child is sure to feel good when riding along the street. The rubber tires roll easily along most materials including road tarmac and grass, this also means if they’re learning to ride their mountain bike they can practice on the grass in case they fall. There are many different types of tire out there though so you may not want to get this type. It’s simply a preference we have because we know it’s good and suitable for kids mountain bikes for boys and girls. If you’re looking for a boys bike then the Banana Bike is an excellent choice. But, if you’re wanting a road bike for a girl then the Magna Girls Sweet Heart girl bike is the best pick for you. We would suggest either the RoyalBaby BMX Freestyle or the Dynacraft Hot Wheels BMX bike for a 5-year-old as they’re ideally made for younger boys. Again we would say the RoyalBaby BMX Freestyle or the CubeTube model as they’re good for growing children we need adjustable handlebars and bike seats. The RoyalBaby Space Shuttle is a stunning choice for a 10-year-old boy, it has extra features and adjustable handlebars to keep up with their fast growth. The Huffy So Sweet bike is a perfect choice for little 9-year-old girls, it’s cute and has some pretty features including a pink frame. What more could they want? Nothing! 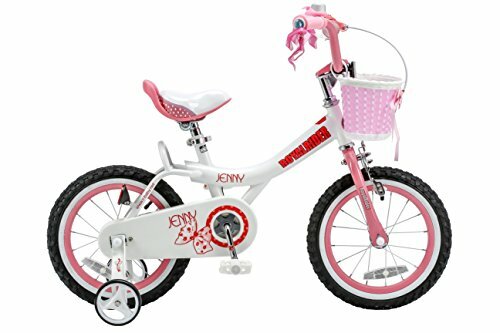 The Royal baby Jenny & Bunny bike is better for older girls as it’s made with an adjustable seat and handlebars meaning they can almost never grow out of it. It also has higher weight restrictions, so it doesn’t matter how tall they become. Always buy a bike that suits your child’s size, even if it means you spend more. It’s essential that you find a bike size that fits how tall your child is if you don’t then it won’t last as long as you hope because they won’t have room to grow and develop with their bike. Bicycles were introduced in the late 19th century in Europe, and they have grown in popularity over the last few centuries. They are even ranked as the principal means of transport in many regions and countries all over the world.